YELLOWSTONE NATIONAL PARK proposes to kill roughly 1,000 wild bison this winter — mostly calves and females — as officials seek to reduce the animals’ annual migration into Montana. Park officials met last Thursday with representatives of American Indian tribes, the state and other federal agencies to decide on the plan. “Through the legal agreement the National Park Service has to do this,” said Yellowstone spokeswoman Sandy Snell-Dobert. If there was more tolerance north of the park in Montana for wildlife, particularly bison as well as other wildlife, to travel outside the park boundaries, it wouldn’t be an issue. Despite that aggressive effort, the park’s herds remain at near-record levels. Last winter, officials removed 737 of the animals, falling short of their target of up to 900 animals. This year’s proposal puts more emphasis on killing females and calves, to reduce the population’s reproductive rate. 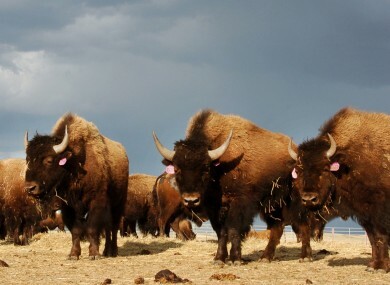 The burly species, also known as buffalo, once roamed most of North America and numbered some 30 to 60 million animals, according to the US Fish and Wildlife Service. As the West was settled, commercial hunting drove bison nearly extinct. By 1884, an estimated 325 remained in the United States, according to the service. Attempts to relocate portions of Yellowstone’s herds to avoid mass slaughters have seen minimal success, amid opposition from ranchers and landowners worried about disease and competition from bison for grazing space. Montana Governor Steve Bullock last year proposed allowing bison to roam year-round in an area west of Yellowstone if the population drops to fewer than 3,500 bison. The Democrat has yet to make a final decision, spokesman Mike Wessler said last Wednesday. Email “1,000 bison might be killed at Yellowstone Park this winter”. Feedback on “1,000 bison might be killed at Yellowstone Park this winter”.